TriStar Apparels reopened their factory at Polpithigama in the Kurunegala District yesterday. The factory will provide 600 job opportunities including 289 Ranaviru Families in the area. The chief guest for the ceremony was Secretary, Minister of Defence Gotabhaya Rajapaksa. TriStar Apparels Chairman Kumar Dewapura said this factory will cater to the UK and USA markets. It commenced full operations yesterday. 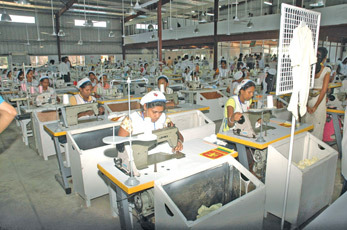 Through this factory we expect to assist and uplift livelihood of Ranaviru families in Kurunegala District, he said. TriStar Apparels is also planning to open an apparel village in Batticaloa during this year. Dewapura said that this project will commence with USAID assistance. It will provide over 1,500 job opportunities for the people in the area. This apparel village will consist of all accessories needed for the apparel industry. Talking about the recently opened factory in Thambalagamuwa in Trinco, he said that they have provided 1,000 job opportunities for the people through this project. This factory is catering to UK buyers.